Move over mimosas, brunch has a new drink! 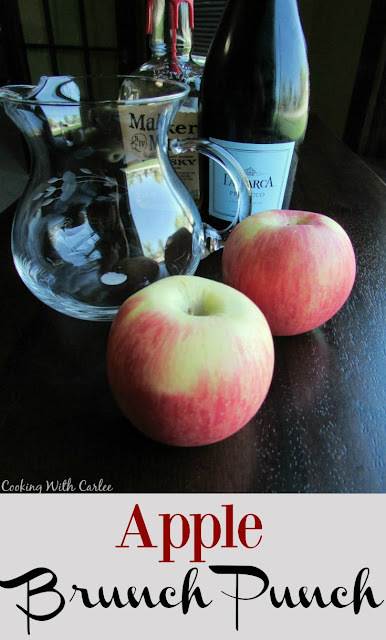 Apples, bourbon and prosecco team up for a refreshing breakfasr drink. How are you guys enjoying #BrunchWeek so far? I am loving it! My must make list is growing by the minute. We are having breakfast for dinner every day for the foreseeable future and then for a few more weeks after that! As a kid, brunch meant one thing; belgian waffles. Of course they had to have strawberries and whipped cream on them too! We used to go to a brunch buffet at the country club up the street some Sunday mornings and that was a must have on those days. Of course I would certainly not snub my nose at waffles with strawberries and whipped cream now either. In fact I would very happily accept. But as these things go, my brunch expectations have changed slightly. A good adult brunch requires a good drink. Of course the thing that immediately comes to mind is a mimosa. Don't get me wrong, I love a good mimosa but I feel like you all know how to do that already. So I thought it would be fun to give you another option. That is when it struck me! Rainier Fruit Company sent some delicious Lady Alice Apples. Why not do an apple version instead? 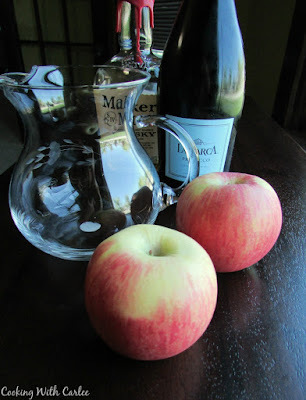 In fact, the idea of using apples with Prosecco or any sparkling wine for that matter seemed perfect. Using apple juice instead of orange juice makes the drink feel lighter, brighter and not quite so heavy. Apples and bourbon seem to pair so well together, so I thought it would be fun to throw a little of that in there too. You know, for good measure and whatnot. Then to top it all off I grated an apple as finely as I could to give it that fresh and fancy feel. This is a perfectly fresh and fun way to stay refreshed while eating a Parmesan Polenta Bowl for instance, or a fun savory waffle creation I have coming later this week. In a pitcher, mix together the sugar, apple juice and bourbon. Using your finest grater, grate in the apple. Chill this mixture and the Prosecco until ready to serve. 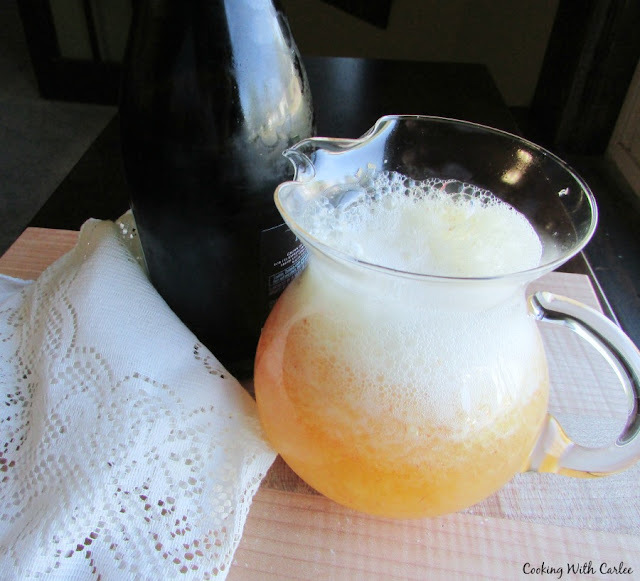 For serving, either add the bottle of Prosecco to the pitcher or pour a bit of the apple mixture into the glass and then fill with Prosecco. This recipe is intended for individuals ages 21 & up. Please drink responsibly. This recipe is intended for individuals ages 21 & up. Please drink responsibly. Thank you to #BrunchWeek Sponsors: Red Star Yeast, Dixie Crystals, Cabot Cheese, Nielsen-Massey, Rainier Fruit, and Michigan Asparagus for providing the prizes free of charge. These companies also provided the bloggers with samples and product to use for #BrunchWeek recipes. All opinions are my own. The #BrunchWeek giveaway is open to U.S. residents, age 18 & up. All entries for the winner will be checked and verified. By entering you give the right to use your name and likeness. The number of entries received determines the odds of winning. Six winners will be selected. The prize packages will be sent directly from the giveaway sponsors. The #BrunchWeek Bloggers are not responsible for the fulfillment or delivery of the prize packages. Bloggers hosting this giveaway and their immediate family members in their household cannot enter or win the giveaway. No purchase necessary. Void where prohibited by law. This promotion is in no way sponsored, endorsed or administered by, or associated with Facebook, Instagram, Pinterest, or any other social channel mentioned in the #Brunchweek posts or entry. Heaven in a glass!! I love Prosecco so I know I would be all about this because with apple juice and bourbon....YES!!!! Ha! A great way to start the day! Thanks, Andrea! I love that you grated the apple right into this drink. It added a little texture and made it more fun to look at! Thanks, Wendy! This looks like the perfect brunch punch! Hi Carlee, when I see drinks like this I really wish I enjoyed the taste of alcohol, but other than the odd glass of sweet red wine or fruity cider when the mood takes me I really don't enjoy it. It does look good though and I will pin for future reference, 'cos you never know! I really don't drink often either. It just isn't "my thing." But I do enjoy trying a drink like this every once in a while! Thanks, Debbie! I hope he loves it! Haven't all of these brunch dishes been fun? I'm not normally one to be interested in a punch recipe, but you sure got my attention with this one! Hehe! We have a renewed love for punch at our house! 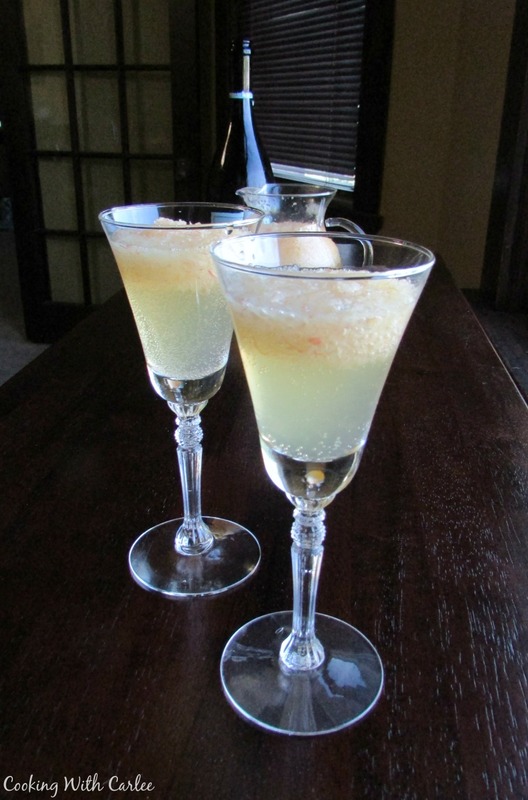 Grated apple in a drink - now that's an idea! Sounds like the perfect drink to toast with at my brother-in-law's rehearsal this fall. That would be perfect! Thanks, Lauren!